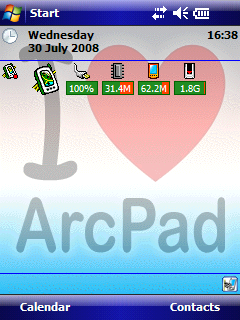 Wear your heart on your Windows Mobile device with this little ArcPad theme. and then follow the simple instructions included. It's another year and another ESRI User Conference, and we've got plenty of ArcPad content lined up for you. ArcPad Team members will on hand presenting the sessions and manning the Mobile GIS Island in the exhibit hall. In addition to covering the existing ArcPad 7.1 release, we will also be previewing the forthcoming ArcPad 7.2 release. You will get to see some of the very exciting enhancements we've been working on, including an upgraded user interface and direct data synchronization with ArcGIS Server. Below you can find a summary of the ArcPad sessions. We are often asked about the secrets of our development process. So here is an insight as to how our Project Manager, Marika is able to guide the development team towards the upcoming ArcPad 7.2. Marika knows the goals and with a firm hand sets the rules and direction of play. Whilst there may be lots of debate and discussion during the development team meetings, once Marika makes the decision the umpire's call is respected. No it’s not dead and it hasn’t been discontinued or deleted. In fact QuickProject is in rude good health! With the release of ArcPad 7.1 and then 7.1.1, a lot of the attention of users has been drawn to features such as AXF and the Geodatabase, enhanced querying capabilities and even the new ArcPad Data Manager extension for ArcGIS Desktop. With all this focus it’s easy to lose sight of QuickProject, a “ready to use” data capture project tool. For many users, especially those new to ArcPad, sometimes there is a need to go into the field—sometimes with no pre-existing data—and start capturing data as quickly and easily as possible. QuickProject was designed specifically for this scenario and is a handy and effective tool for providing a simple and efficient method for capturing data into new shapefiles. • Closes the existing map, or gives you the option of including your existing layers in the new project. • Creates three basic shapefiles (point, line and polygon) inc. a map projection – this can be the QuickProject default (WGS 1984) or a user selected projection. • Creates a custom edit “Quick Form” complete with 5 generic data fields and associated attributes in the categories field. These categories are fully editable for description and symbology, plus you add additional categories and symbology as required. • Finally – the QuickProject tool wraps it all up in a Quick Project .apm and loads it onto ArcPad ready for editing and / or use of the Identify tool. This addition to ArcPad is a really quick and handy method of getting basic data collection projects underway in no time at all and a real bonus to any new users still finding their feet in the world of MobileGIS. A full explanation of QuickProject and how it works can be found in the ArcPad User Manual as part of Chapter 6: Creating New Data.